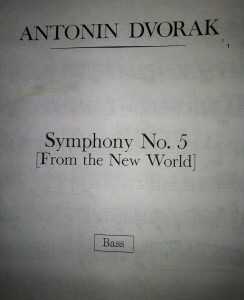 This first performance of the Panama City POPS 2011-2012 season will open at the Marina Civic Center with Dvorak’s New World Symphony. We had played individual movements before but this is the first time we will play all four movements. The themes in NWS are so strong an beautiful. In the adagio is a classic bass line that just scream classical bass playing. And the third movement (my favorite) is just going to be a wild ride. This is going to be very demanding but worth it! Our bass section had its first sectional rehearsal today and worked on the bowing and some of the more demanding phrases. I’m really lucky to have other bassists that take the music seriously enough to practice. That is very refreshing. We also are doing two arrangements from John William’s score for the movie Jurasic Park. These are really fun to play and at one point my bass sounds like dinosaurs. Nice. Anyway, that is what is on the stand right now.